This splendid head piece of tiara-form was either meant to be attached to a hat or crown, or was part of a wider ensemble of pieces decorated with blue kingfisher feathers that combined to make once composite headdress. 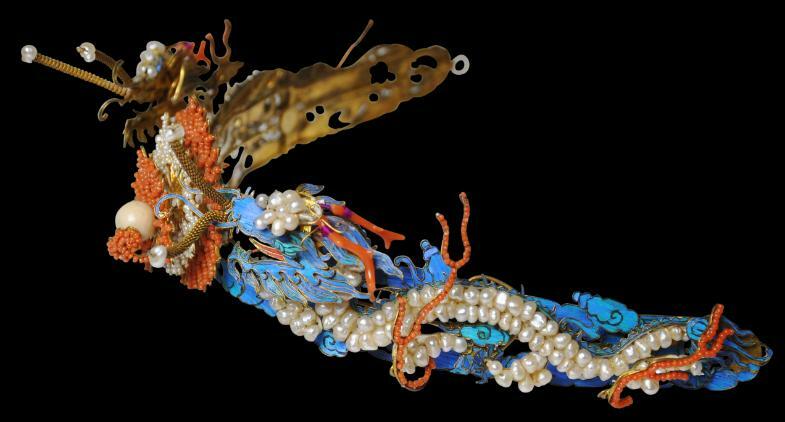 Other than full crowns, it is one of the finest and most extravagant items of kingfisher feather ornaments that we have seen published or otherwise, including those in the National Palace Museum in Taipei. en tremble settings so that they tremble as the piece is moved. Dong pearl with four separate panels of ‘flames’ – a small one in front consisting of small coral pieces; a larger coral one behind; and then behind that, one of dozens of tiny pearls; and behind that, the largest one of dozens of tiny corals. The quality and the profusion of expensive items used in this piece’s construction suggests that it is an Imperial piece. Indeed, the motifs of a pair of dragons separated by a flaming pearl is masculine and either meant to be worn by a man or perhaps by a woman deemed to have masculine-type powers such as a female member of the royal family. 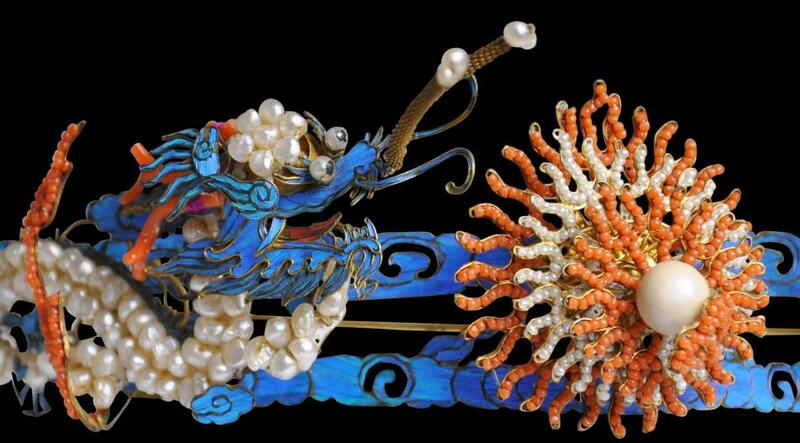 However, more typically, the dragon was the symbol of the emperor and the phoenix was the emblem of the empress. The pearl is associated with spiritual energy, wisdom, prosperity, power and immortality. The dragons also have five claws on each leg. This further suggests an Imperial provenance. The Hongwu Emperor of the Ming dynasty followed the Yuan dynasty rules on the use of the dragon motif and decreed that the dragon would be his emblem and that it would have five claws. 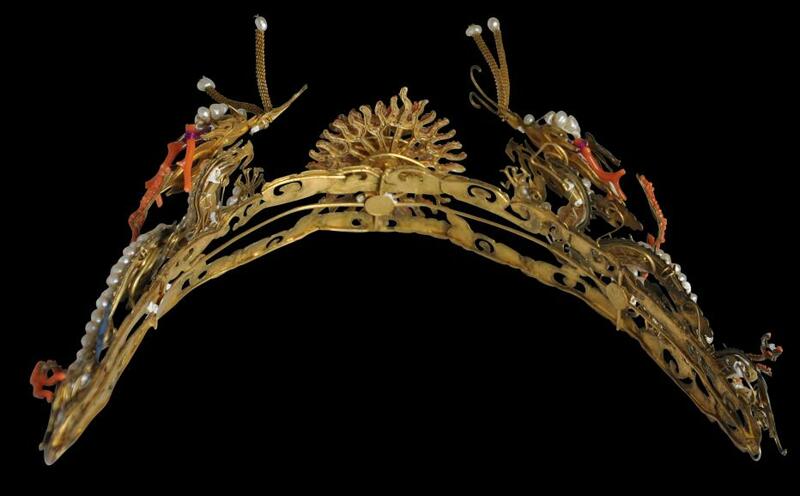 The Ming Emperor Wanli’s ‘Black’ crown for example, excavated from the Ming Tombs, comprised a pair of dragons chasing a flaming pearl. It too was decorated with blue kingfisher feathers. The four-clawed dragon was then reserved for the nobility and certain high-ranking officials. The three-clawed dragon was used by lower ranks and the Chinese public more generally but typically, only those with some kind of government connection used the dragon motif at all. It was a capital offense for anyone other than the emperor himself to use a gold-colored, five-clawed dragon motif with improper use of claw number or colors being considered treason. These conventions were carried forward by the Qing emperors, and Qing emperors typically were depicted with five-clawed dragons. How would such a piece have found its way outside the palace? Works of art often were pilfered from the Imperial collection, often by court eunuchs, and sold to foreigners to raise money. The condition of this piece is excellent particularly when compared with most other surviving kingfisher ornaments. Almost all the feathers are intact (there have been no replacements). There are minor losses to some of the corals. A small element of one of the dragons is now missing, although this is not readily apparent. But overall, the ornament is among the best preserved of its type that we have seen. National Museum of China, London Editions, 2011.
private collection, London; UK art market.